written by Unknown and has 3 comments. - The definition of cold: In Beirut, it's around 10°C. Beirut's cold is almost Göteborg's spring. Just so you get an idea of what I mean, when I walk around in winter in Göteborg, I have to tuck my mp3 player's earphone wires under the jacket so they don't freeze. - The reaction to rain: One of the first things you'll notice in Göteborg, is that people don't hide from the rain. If it starts raining, they keep going about their business casually. In Beirut, rain is most often associated with people staying home. I guess that has a lot to do with the nature of the rain, you see Swedish rain doesn't seem to believe in gravity. It's this very light rain that dances with the wind and finds its way into every possible hiding place on your body. Lebanese rain on the other hand is a full-on cold shower that leaves you drenched in little over a minute. - It snows, but life goes on: This one is a bit too obvious. It snows in Göteborg, and this year it snowed a lot. But everything was fine, life was not interrupted. It doesn't snow in Beirut, but given the kind of traffic mayhem only rain can cause, I think it's for the best. Okay so the nature is different... What about the people and the cities themselves, you ask ? - Honking your car horn: The car horn is an essential part of the car in Lebanon. In fact, it is an essential aspect of daily life. Whether you want to warn an approaching car to let you through, say hello to a friend who happens to be driving next to you, tell your girlfriend that you're parked right outside her door, show support to a political party (every party has their own honking rhythm), you name it... When in Lebanon, you honk your horn. It's part of the culture, it's pretty much our second official language. Needless to say, a driver honking his horn in Göteborg is such a rare event, that it surprises you every time. - Did you say Public transport ? Wherever you want to go here in Göteborg, buses, trams and trains will get you there, and reliably so. You look up your itinerary online, go to the bus/tram stop, and you bet your transport will be there on time. - There's the right way, and there's the Lebanese way: Chaos is a major player in the Beirut dynamics. Cheating too. If you've been to Beirut, you've probably been exposed to this aspect of the culture: Cheating is alright, correctness is stupidity, and there's always a way you can bend the laws to your advantage. The exact opposite of Göteborg, at least as far as I know. 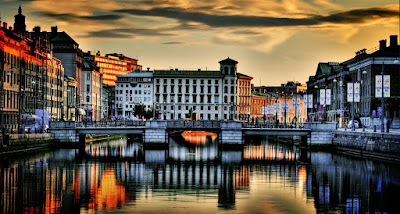 - The meaning of Multicultural: Beirut and Göteborg are both highly multicultural cities. Some readers in Beirut just went "Really ?". Let me explain. In Göteborg, you go to university, and your classmates are people from pretty much every part of the globe you can think of. You go to work, and you get a pretty nice cultural spectrum there as well. In Beirut, pretty much everyone in your class or your office is Lebanese. So where's the diversity you ask ? Check it out... You have Egyptians pumping your gas, SriLankans cleaning your house, Indians taking care of your building, Filipinas raising your children, and Syrians building your city. It's slightly racist you might say, and I agree, but it just happens that we associate jobs (the ones we don't want to do ourselves that is) with nationalities, and we stick to our choices. While in Göteborg you get the chance to discover new cultures every day, most people in Beirut choose to ignore that opportunity, and only interact with our foreign workers when there is something they need done. Their loss I'd say. - No two-drink minimum rule: If you've been in Sweden you would know that people don't normally talk to you on the street unless addressed to first. This is true in Göteborg, until 7pm that is. From then on, the drinking starts, and the Swedes become more social. A lot more social. In fact, two drinks into the night, Swedes become even more social than the (sober) Lebanese, and that's saying a lot. In Beirut random people are likely to talk to you all the time, whether asking for directions, openly telling you what they think of the way you look, or complaining about a common situation you might share with this person, you can be certain never to be out of conversation buddies in Beirut. Swedes are great, and very polite. They just don't do first steps very well. When my friend Sonia and I decided to carry a sofa I had just purchased all the way back home (a quite heavy sofa that ended up taking the bus I might add), it seemed amusing to everyone whose path we crossed, and so pretty much every Swede we met said something to us, one even honked his car horn to show support! I think that was the only time so many sober Swedes talked to us for no reason. I'll stop here for now, if I don't I could go on forever. The one thing I would like to add, is that both cities have tremendous charm, and no matter how critical of Beirut I get (I did move out after all), I still love this city, not just for the memories it holds, but for that inexplicable essence that makes it Beirut, a city I'm about to leave again. The next post will probably be from Göteborg, and it might be another year before I get to visit Beirut again, so goodnight for now, I hope I've painted a fair picture, and that you're now curious to visit Beirut, Göteborg, or both. Read the sequel "Working in Sweden: A Beirut vs Göteborg Special"
That sounds pretty correct about Beirut. However, I'd like to add that even though we are sometimes critical of this city, and even though all this description makes it sound like complete chaos and awful to live in, it's just part of its charm. It just seems to me that it's a city where everything goes. That said, I have to admit it pisses me off sometimes. I'd love to know what it's like to be in a city where you do not hear cars honking; you can't truly believe in the existence of noise pollution until you've visited Beirut. I can live with the honking in Beirut, I find the service taxi system extremely practical as a form of semi-public transport, and I am really happy that the Lebanese don't have to drink to be sociable, unlike many people from my home country. On the other hand it does seem like there is little reward or incentive for people trying to do the "right" thing (like not throwing whole sacks of rubbish over the nearest wall). This is a really interesting story. Thank you!